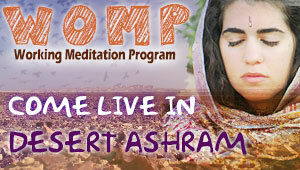 WOMP (WORK as MEDITATION PROGRAM) is the ashram's flagship program and is our invitation to you to come and join our community. We are a community that has devoted its life to meditation and awareness while connecting to the pleasures of life. During WOMP, we dance and sing and also meditate quietly. We learn to integrate meditation and awareness into our everday lives. This is not a 'time out' of life - it's life as a 'time-out,' because we do not really believe in the movies we create for ourselves. The program is open all year long and registration is always open. During these 10 days, we celebrate with more totality the glory of this program. We raise the daily activities with more meditations, therapy work, and devote more time to examine our priorities to create more balance within. What surprises are waiting for you? In addition to our amazing WOMP guide for the past two-year, Tarla, the legendary Nirvana will join us. Nirvana guided WOMP for 5 years and has had a deep impact on so many of us. When does all this amazingness happen? February 10-19. If you have already been with us as a WOMP, you can join at any time - for a minimum of 3 nights. If you have not yet given yourself this gift, you can also join anytime, even before and after, for a minimum of 10 nights. With over 15 years of experience as a group facilitator, yoga workshops, meditation and inner work. One of the founders of Desert Ashram. A certified Level II Kundalini Yoga teacher. Mandala artist and Musician.